Posted: Monday, April 15, 2019. 2:57 pm CST. By BBN Staff: Wil Maheia of the Belize Territorial Volunteers (BTV) shared a video with media personnel of an incident that occurred this morning in the Sarstoon river. 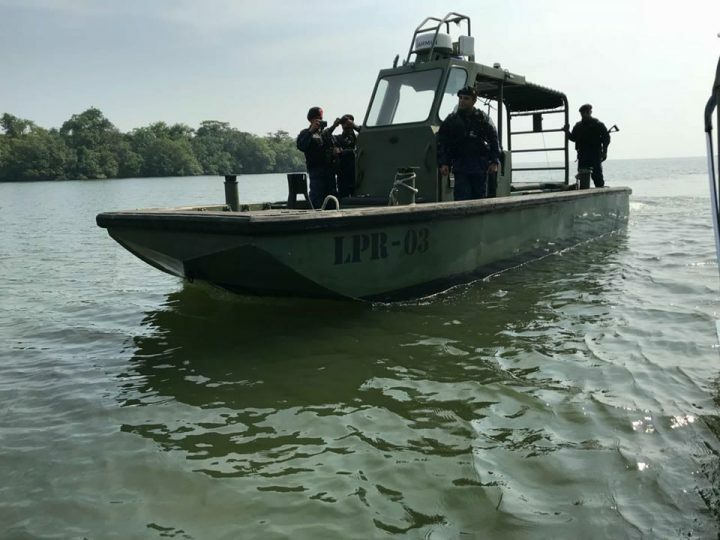 According to Maheia, around 10:30 a.m., members of the Belize Coast Guard were patrolling the Sarstoon river when they were intercepted by gunboats from the Guatemalan navy. The Guatemalan gunboats blocked the pathway of the Belize Coast Guard and prevented them from going further up the Sarstoon river. The video depicts three (3) gunboats with armed Guatemalans and carrying the Guatemalan flag that stopped in front of the Belize Coast Guard boat. The mission of the Guatemalan navy was evident in the video and can only be classified as a case of ‘extreme provocation’. Thankfully, calm heads prevailed with the professional rank of the Belize Coast Guard and the officer in charge gave instructed his men to turn the boat around. The Belize vessel then headed back to the Belize Coast Guard command post after the incident. For some time now Guatemala has been using its military might to give the impression that they own, and are in control of, the Sarstoon river. Guatemala, acting as an ‘ignorant’ nation, is disrespecting and continues to disrespect the confidence building measures signed between Belize and Guatemala in 2000. In addition Guatemala has shown little regard for international standards and law that recognizes the center of the deepest channel of the river in all cases where that river forms the border between two (2) nations. It is clear that Guatemala is closely looking at the current events in Belize relating to the postponement of the national referendum on whether or not to take Guatemala’s claim to Belize’s territory to the International Court of Justice (ICJ) for final settlement. Belize would have conducted its referendum on April 10, 2019, however it was postponed due to an injunction granted to the PUP by Chief Justice, Kennett Benjamin. Today, the Chief Justice set April 29th 2019 as the new date to hear the ICJ referendum injunction case.